Controllers at NASA's Jet Propulsion Laboratory sent a final command Friday morning to the Cassini spacecraft orbiting Saturn. Not long after, accounting for the vast distance the message traveled, the order was received, putting the craft into a suicidal swan dive in which it plummeted into the ringed planet's atmosphere. Flight Director Julie Webster called "loss of signal" at about 7:55 a.m. ET, followed by Project Manager Earl Maize announcing "end of mission" as the spacecraft began to break up in Saturn's atmosphere. "Congratulations to you all," Maize announced to applause. 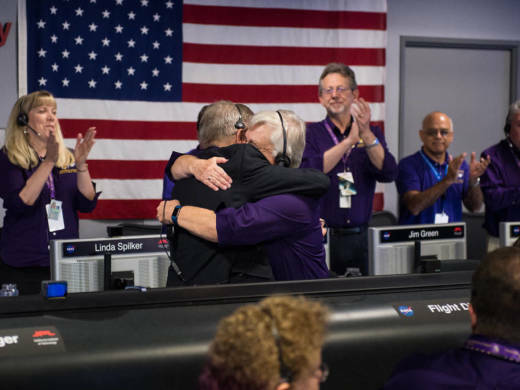 "It's been an incredible mission, incredible spacecraft, and you're all an incredible team." With Cassini running on empty and no gas station for about a billion miles, NASA decided to go out Thelma & Louise-style. But rather than careen into a canyon, the plucky probe took a final plunge into the object of its obsession. Just how obsessed? Its 13-year mission to explore the strange world of Saturn went on nearly a decade longer than planned. It completed 293 orbits of the planet, snapped 400,000 photos, collected 600 gigabytes of data, discovered at least seven new moons, descended into the famed rings and sent its Huygens lander to a successful 2005 touchdown on the surface of yet another moon, Titan. First, Cassini had to get to Saturn. The year it blasted off, 1997, the "information superhighway" was just getting up to speed. By the time it arrived, in 2004, people were fretting over what to reveal on their Facebook profiles. On its way to the sixth planet, Cassini set about a circuitous course, swinging by Venus twice to get a gravity assist that shot it back past Earth and onward to Jupiter before a final marathon leg to Saturn. The twin Voyagers swung by Saturn in the 1970s and '80s, giving scientists a rough outline of the planet and its moons. Cassini has filled in many of the details, giving us an unparalleled look. Much of what Cassini found concerned Saturn's moons. Among other things, the probe discovered water spewing from Enceladus, discovered that Hyperion has a statically charged surface and that Saturn's entire moon system — a virtual mini solar system in itself — exchanges dust and chunks of material with the planet's ring system. "Two of those moons have been of particular interest," NPR's Joe Palca reports from JPL headquarters in Pasadena, Calif. "Titan, with its methane lakes and Enceladus, with its geysers of salty water. Scientists speculate that both moons may have the right conditions to harbor some form of life, although Cassini did not have instruments capable of detecting life." One of Cassini's crowning achievements came in April of this year, as it spun through a narrow gap in Saturn's rings, beaming back images and making scientific measurements along the way. Why end the mission? Although Cassini's main power is supplied by radioisotope thermoelectric generators, or RTGs — essentially nuclear batteries that were still going at mission's end — the fuel supply for the probe's main engine and backup was believed to be running low. "We don't have a gas gauge. It would be really nice if we did," Molly Bittner, a systems engineer at JPL who has worked on Cassini for the past four years, tells NPR. Instead, mission controllers had to estimate the amount of fuel used by each maneuver. And there had been lots of maneuvers since 2004. NPR's Adam Cole, who helped produce a video commemorating the spacecraft's life and times, says: "Scientists [were] worried that when [Cassini] loses power, it could crash into a pristine moon, contaminating a place where we might someday search for life." However, there's another reason for ending the mission in such a spectacular fashion: "We have the opportunity to do some really cool science," Bittner says. While Cassini has discovered a lot of interesting things about Saturn, its ring system and its moons, there's one thing it hasn't been able to pin down with certainty — how long a Saturnian day lasts. "It's a little bit embarrassing to confess, but we don't know how long a day is on Saturn," Michele Dougherty of Imperial College in London tells NPR's Palca. She's the scientist in charge of Cassini's magnetometer, an instrument that measures Saturn's magnetic field. Dougherty is hoping that as Cassini spiraled into the atmosphere, the onboard magnetometer detected a telltale tilt in the magnetic field that should resolve the uncertainty over the length of a Saturnian day, Joe reports. Bittner says that in the final moments of Cassini's life, another instrument, the Ion and Neutral Mass Spectrometer, or INMS, was to open up, sucking in the atmosphere to figure out what it's made of.